Love Peter Boyle. He is missed. I remember the ads for it; never saw the movie. Did you ever cover The Name of the Game? 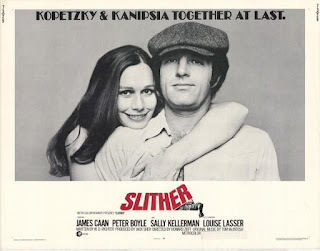 I wonder why there is not that much attention paid to this ground-breaking series by TV or film historians--considering that it launched the careers of Stephen Spielberg and Steven Bochco. And guest-starred a lot of Golden Age film stars, such as Broderick Crawford, Gene Tierney,Orson Welles, etc. One two-part episode had cameos from the entire Vegas Rat Pack (except Judy Garland who was dead by then). You can get some of the eps.on Bootleg DVD but that's it. Nothing but trailers on Youtube. Yup, I remember Bracken's World with Peter Haskell--who was in a lot of stuff on TV in the 70s, including The Eyes of Charles Sand and Love, Hate, Love--an interesting stalker-thriller TV movie with Ryan O'Neal and Leslie Ann Warren. The bootleg DVDs of The Name of the Game are missing 17 episodes, among them "We Love You, Billy Baker" which was the two-part Rat Pack episode starring Sammy Davis Jr. and featuring cameos by Frank, Dino, Joey Bishop and Peter Lawford. It's a shame that the series has never gotten the official DVD treatment. Yes, it is... Perhaps if a remake was planned it would shine some light on the original. They are worth watching just for Sammy's weird hippy wig and bizarre haute 70s hipster fashions. Ray Charles was a phenomenally talented invidivudal. In the second clip, he blows both Sammy and Tony Martin totally out of the water. What a treasure that man was. Yes, indeed. He makes it look so easy.